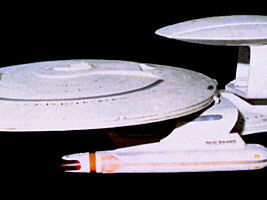 The original full-scale Nebula model with the distinctive elliptical "AWACS" pod mounted on top. First and only appearance in TNG: "The Wounded". A modification of the miniature with a new triangular pod. As seen in TNG: "Redemption, Part II". Still the same model, but with several detail changes. Appeared in "Star Trek Generations". I assume that this model remained practically the same after that and was initially seen on DS9 too (probably labeled USS Leeds and just with new pennants). CG model with additional detail differences that make it more Galaxy-like. Appeared in DS9: "Waltz" and VOY: "Message in a Bottle", as well as a number of other DS9 episodes. The model apparently kept the name Bonchune until VOY: "Endgame". 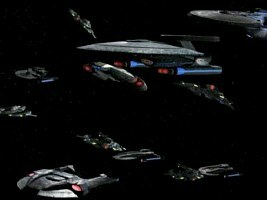 Note Unnamed Nebula CG ships can be seen in several battles during the final two seasons of DS9. In some shots, like in "The Changing Face of Evil", the saucer proportions looks distorted (a too cone-like almond shape). Yet, this CG model is likely the same as the Bonchune, only without the saucer labels. The Nebula is sometimes thought to be smaller than the Galaxy class. At least this was the original intention by the designers. 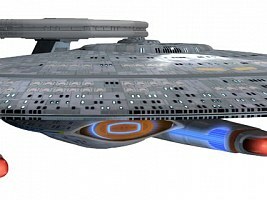 Rick Sternbach writes at TrekBBS: "The Nebula class was supposed to be smaller than the Galaxy class, IIRC; the saucer shape is similar, but the bridge module is larger in proportion to the saucer size, as are the windows. The fact that the Nebula saucer looks like a Galaxy saucer (shape, colors, various design elements) doesn't exactly help the situation, but there it is." The analysis below, however, will prove that there is actually no visual difference of the window or bridge sizes between the two ship classes. Rick Sternbach may have referred to a study he made, or he could have confused the Nebula with the New Orleans that really has larger windows and a bridge at a different scale. Concerning the Nebula, we can conclude that two ships which use parts with identical proportions and the same details must have the same scale. With a number of components being identical to the Galaxy class, we may achieve an educated guess of the Nebula's size. 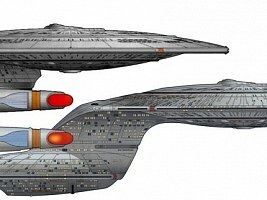 The length of the Nebula class (Sutherland and Farragut variant) can be determined comparing available Nebula diagrams to those of the Galaxy class whose dimensions are known (642.5m long), assuming that the two ship classes have the same nacelles and saucers with identical proportions. The side views of the Nebula given in the Encyclopedias I and II and the various depictions in the Fact Files don't show diverging overall dimensions, although the proportions of the saucer, more precisely its height-to-width ratio, are subject to vary. All these side views give us a length of 440m for the Nebula with an inaccuracy of no more than two or three meters. There is only one reference of the ship that would yield a different length, the Nebula top or bottom view (of the monochrome orthographic sets) from the Fact Files. If the latter two views were correct, the vessel would be about 465m long (which would be almost the same as its width). 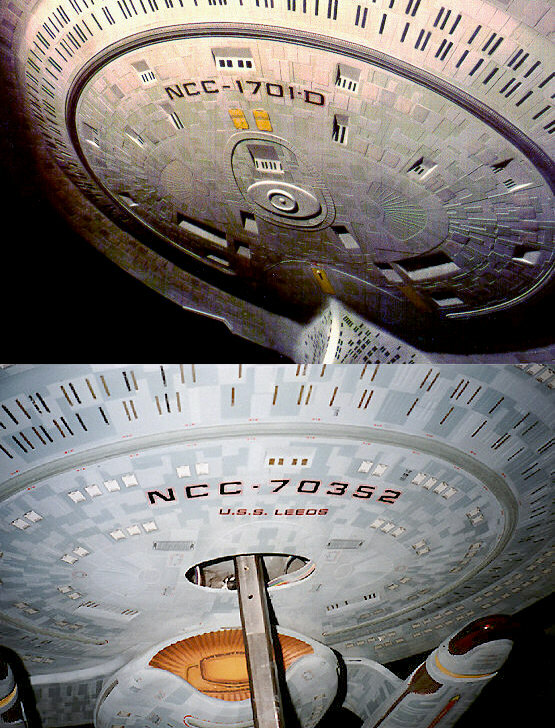 The comparison image shows that the said bottom view doesn't even correspond with the side view from the same set in the Fact Files, although the scales and proportions of the single components (most of all saucer and engines) match well. 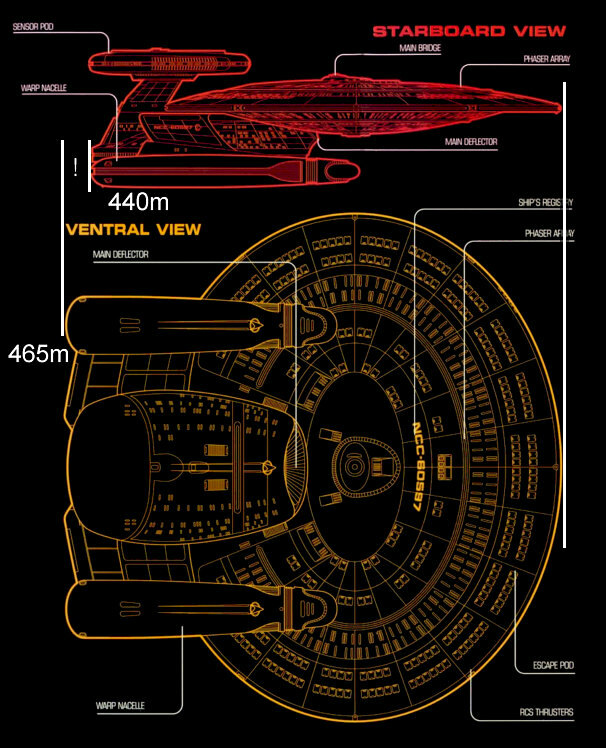 On the bottom view the nacelles are moved rearward, giving us about 25m more overall length. The same applies to the top view (not depicted). 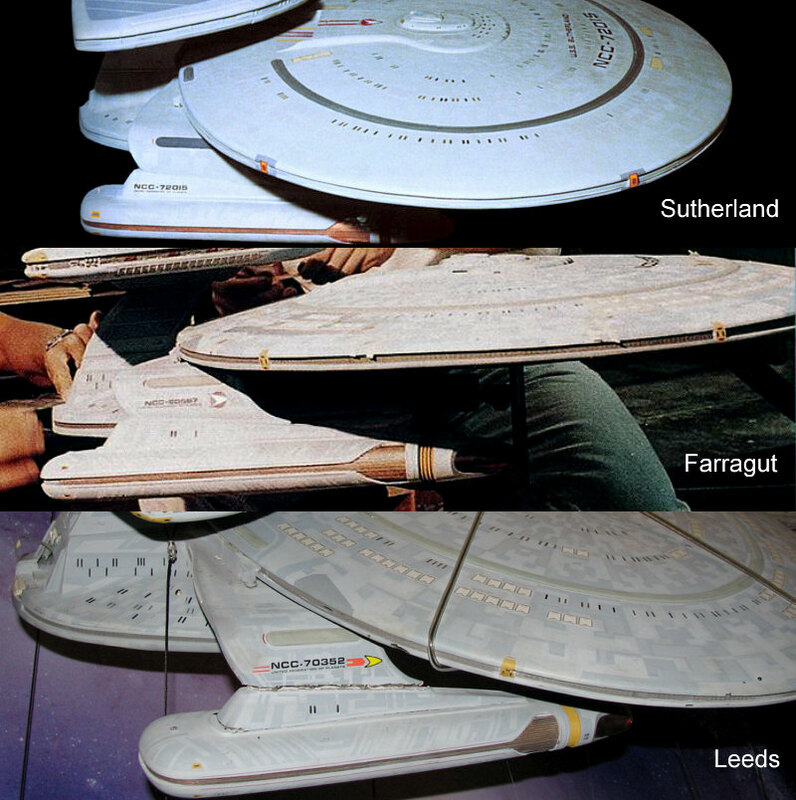 The question which version is correct is not easy to answer, because of the predominantly non-orthographic perspectives of the existing studio model photos of the Farragut or Sutherland, but the relative position of the warp engines and the saucer looks as if rather the side view is correct and the length is only 440m. 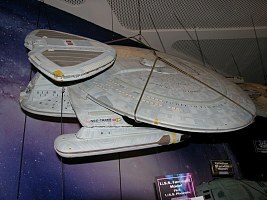 The ship is a bit wider than long in this case, a unique attribute among Starfleet vessels. The Nebula prototypes are kitbashes and therefore have the same engineering hull as the Galaxy class. After an only superficial look at the two classes the same is sometimes assumed for the detailed Nebula model, the Nebula being said to have an identical hull with at most a few meters shaved off at the rear end. 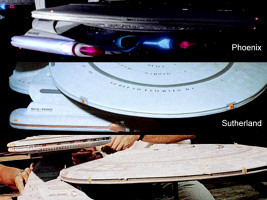 The comparison of available Galaxy and Nebula pictures, however, unmistakably demonstrates that the Nebula's secondary hull is an entirely different part, implying that a new mould must have been utilized for the nebula miniature. The fore view with the deflector dish illustrates that there are two different dishes. Additionally, the very bottom of the Nebula-class engineering hull is curved with a smaller radius. Comparing the aft views we easily recognize the more rounded bottom deck as well, aside from the nacelle pylons that are naturally missing on the Nebula class, making the engineering section more than only a few meters shorter. Finally, it appears that the rim between the upper and the lower half of the engineering hull is taller on the Nebula. All Nebula variants of the studio miniature are largely consistent regarding the engineering hull proportions. The CGI version (at least the Bonchune) doesn't exactly reproduce this look. Here the aft end of the engineering hull look more like on the Galaxy, more pointed and curved and with a thin rim again. The strangely distorted DS9-Nebula even looks like it has the same dish as the Galaxy class and a more pronounced almond shape of the lower hull, which leads to the suspicion that no genuine engineering hull was modeled for it. We can also note that the nacelle struts of the Nebula studio miniature are custom parts and only have the basic U-shaped structure (tipped over) in common with the Galaxy warp pylons. Especially the triangular flange between pylons and nacelles is much thicker on the Nebula. On the CGI Nebula, on the other hand, the latter part is the same as on the Galaxy. This is in line with the observation that the secondary hull of the Bonchune being closer to that of the Galaxy as well. 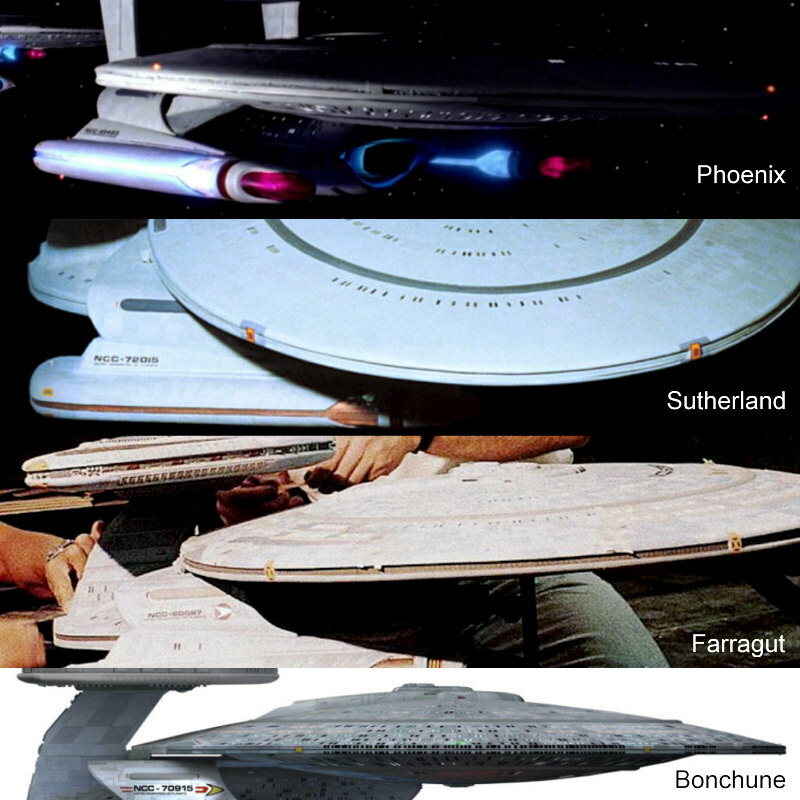 There has been some confusion about the real size of the Nebula saucer because it looked like the initial model (Phoenix) had four decks less in the upper half of the saucer. 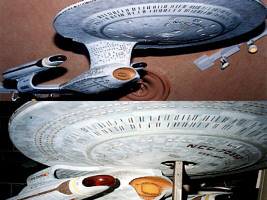 But on all available pictures the Nebula miniature in all of its variants has evidently a saucer with the same overall proportions as the Galaxy, even if the side view in the first edition of the Star Trek Encyclopedia makes an attempt to flatten the saucer, keeping its length. The solution to this enigma is rather easy: The Phoenix is simply missing four window rows in the lower decks of the upper saucer half. 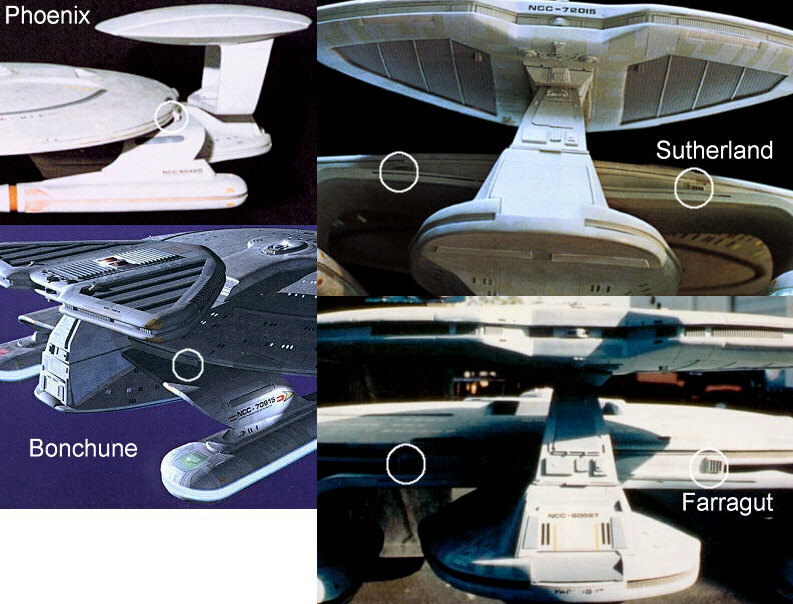 More precisely, some of the decks 6 to 9 have no windows, while on the Galaxy one or two of these decks, located at a very gently sloping part of the saucer surface, include even more than one window row - in other words, some of the windows can be found in the ceilings of these decks. We may only hypothesize, but it is well possible that the Nebula with its purportedly smaller crew has nothing but cargo bays on the decks in question, although it seems a waste of cabins with space view. All hardware versions are lacking these windows. There may be lifeboats on these decks on all these Nebula variants in the same places where they are on the Galaxy class too -- only that they would be very faint on the Phoenix and Sutherland, whereas there is a clear contrast on the Farragut. 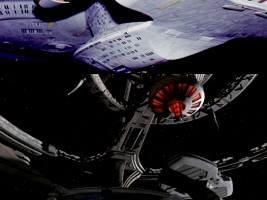 As opposed to what may have been the original intention, the bridge module of the Nebula has the same size relative to the saucer as on the Galaxy. Nonetheless there may be a significant difference between the Galaxy and Nebula miniature saucers. 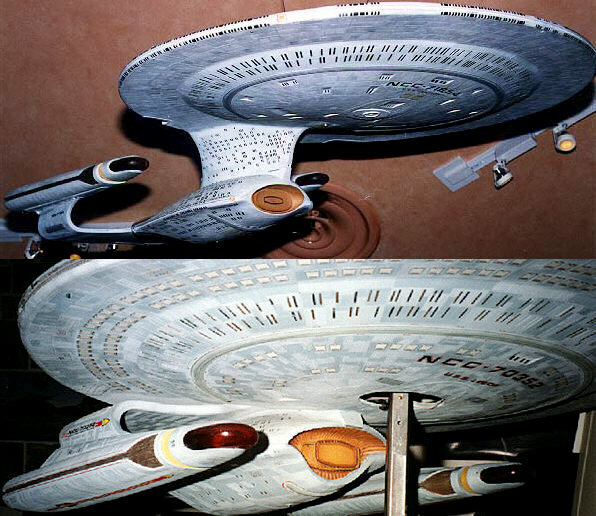 It looks like the upper and the lower half of the Nebula saucer are somewhat farther apart than on the Galaxy 4ft model that the design is based on. It would be the spacing between deck 9 and 10 on both classes. This would go along with the observed wider rim on the engineering hull. We may speculate that these features that create a slightly different perception of proportions might be left over from a time when the Nebula was supposed to be smaller. Aside from the windows, some minor modifications can be observed, such as the transporter emitters that were moved outside the phaser ring at latest for the Sutherland, whereas they can be found on the later Farragut just where they are on the Enterprise-D too. This coincides with the newly incorporated lifeboats of the Farragut. 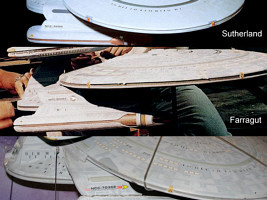 On a further note, the Sutherland seems to be the only version with two short phaser strips at the aft end of the saucer. The firing angle would be considerably limited because of the pod, though. Finally, the CGI Nebula versions have all the windows and the lifeboats of the Galaxy class. The real-life explanation may be simply that the 3D modeler could have taken the primary hull without changes from the Galaxy. 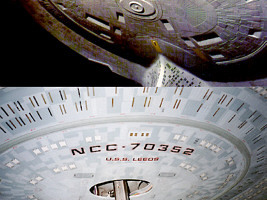 Most likely all other barely recognizable details on the saucer are identical too. The underside of the early Nebula variants is barely recognizable and doesn't seem to have the window insets of the Galaxy saucer. The picture of the later incarnation as USS Leeds confirms this notion. 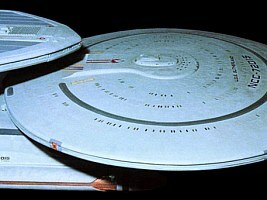 There are only cut-outs for the secondary deflector and the large set of windows behind the center line of the saucer. Other than a different position of the transporter grids, there is no further difference compared to the saucer underside of the Galaxy. There is probably intended to be a captain's yacht too, although the mounting point of the model (which we don't expect to ever shift) is exactly where we would look for the auxiliary vessel. Strictly speaking the existence of a yacht is only speculation. 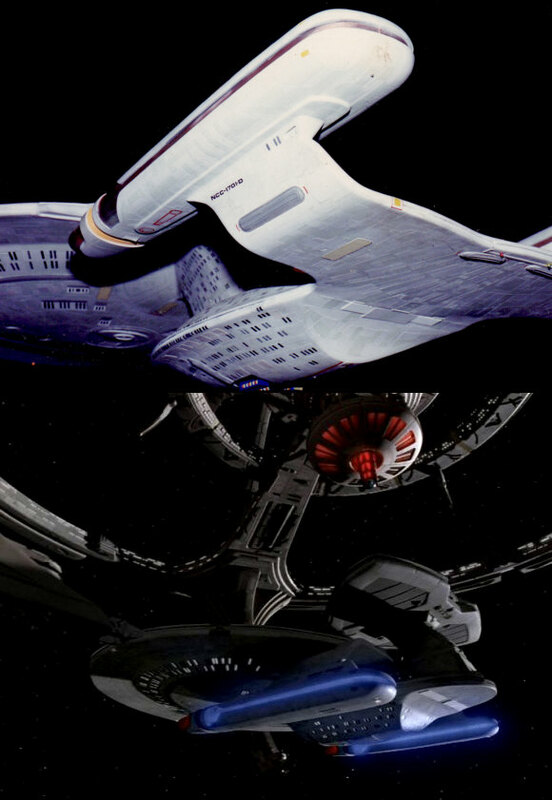 The CGI Nebula has all the window insets of the Galaxy class on the ventral side of its saucer, just like the top side is the same too. 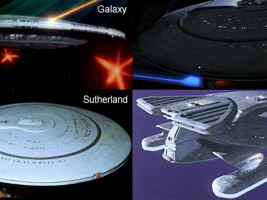 The Galaxy class encompasses four rectangular RCS blocks on the saucer. It is surprising that the first "real" Nebula to appear, the Phoenix, does not seem to have thrusters at all. It is the easiest explanation that they were simply forgotten, though any ship of the class would need them. This evident error was later corrected. Yet, the Sutherland and the Farragut may have two different types of RCS quads. While they seem to consist just of markings on the Sutherland, the Farragut has openly visible nozzles. These may be just painted, still it looks like the thrusters are of a distinct type. The Galaxy thrusters seem to be wider than either of them, marked with essentially just rust brown or orange. Our impression is that the CGI Nebulas, just as they take all other details rather from the Galaxy than from the Nebula miniature, have Galaxy-type thrusters. The saucer impulse engines of the Galaxy class are often said to be too tiny for the ship's size. In this light it surprises that they are still smaller on the Nebula, in particular because the ship class doesn't have an additional central engine. On all miniature variants of the ship the impulse engines seem to be identical. Their location may be regarded as impractical, because the warp pylon obstructs any exhaust with a vector component pointing down. Interestingly, the Bonchune CGI version for once doesn't follow the Galaxy model in this respect, but has the same kind of exhausts as the Nebula hardware models. Only the new shaded "engine hood" exactly where the impulse engines are on the Galaxy is something special about this model. It has been speculated that, because of its registries (especially regarding USS Farragut NCC-60597), the Nebula construction may date back longer (up to a decade) than the Galaxy. More evidence, albeit not very substantial, comes from the hull pennants. The two first Nebulas that show up (Phoenix & Sutherland) have Starfleet pennants akin to those of the Enterprise-D, with an elliptic Starfleet badge as it is commonly used in the 2360s. But the Farragut with its exceptionally low registry still has the presumably old round emblem in 2371. 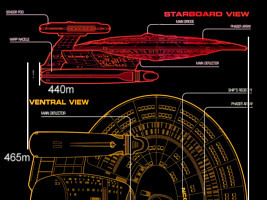 This is not very significant though, as it would merely connote that the ship has most likely been launched prior to the Enterprise-D and hasn't been repainted since. The USS Leeds, finally, sports a modern yellow pennant as it can be found on nearly all ships since 2371, including the Defiant, Voyager and even the Lakota, an Excelsior variant. 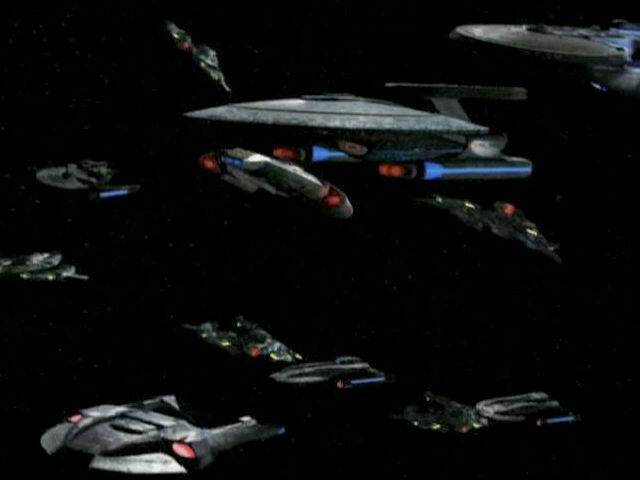 The same goes for the CGI versions, although we never got a close enough look at the later DS9 variant. Something interesting to note, though not very surprising, is that we have seen the Nebula class with different bridge designs. The obvious real-world reason is that there was no permanent bridge set for any of the infrequently shown ships. While we could see only the ready room and a glimpse of a corridor of the Phoenix (TNG: "The Wounded"), a new bridge was built up for the Sutherland (TNG: "Redemption, Part II") and later for the Prometheus (DS9: "Second Sight"). Both may be to some extent redresses of the Enterprise-D battle bridge set, which was unquestionably used for the Enterprise-C and Stargazer. It would have been more plausible and above all less expensive to use the Galaxy bridge for the Nebula class too. In spite of everything, we should expect a quite similar layout, given that the outer appearance of the bridge is identical on both classes. But very likely it was intended to establish a visual difference for the sake of the dramatic impact. Maybe it would be possible to explain away the dissimilarity by simply pretending that in both cases we actually saw the Nebula battle bridge. On the other hand, there would be no problem assuming that the Nebula bridge is actually that small, except that we might insist on something considerably more spacious on such a large ship. We have identified differences between the Nebula variants, deliberately excluding the early kitbashes with their shortcomings concerning the proportions and details that wouldn't allow a proper comparison. The finalized Nebula class sports an entirely new engineering hull. 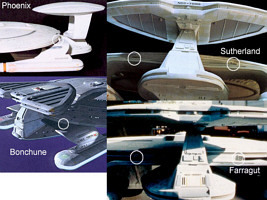 While the overall dimensions of the Nebula and Galaxy saucer and nacelles are the same, there are many significant detail differences. Moreover, we can safely distinguish four sub-classes plus one uncertain variant that we may decide to ignore because the CGI modeler possibly just didn't get the proportions straight. But even the largely correct CGI version (namely the Bonchune) shows a strong tendency to incorporate details from the Galaxy, rather than from the Nebula miniature. A possible reason is that Rob Bonchune didn't have access to the Nebula studio miniature. We probably shouldn't just put that aside, especially since the dissimilarities between the three hardware versions are not quite as significant (except for the AWACS pod of the Phoenix, of course). Yet, we would gladly keep these as three class variants, so the CGI would deserve the same right. As for the age of the Nebula, the old pennant of the Farragut with its low registry is new evidence, but not sufficient to conclude that the Nebula must have been built some time prior to the Galaxy. If we give the registry system any credence it may remain the most plausible explanation though. Thanks to a couple of members of the Subspace Comms Network for fruitful discussion and to Robert Minnes for an additional hint.